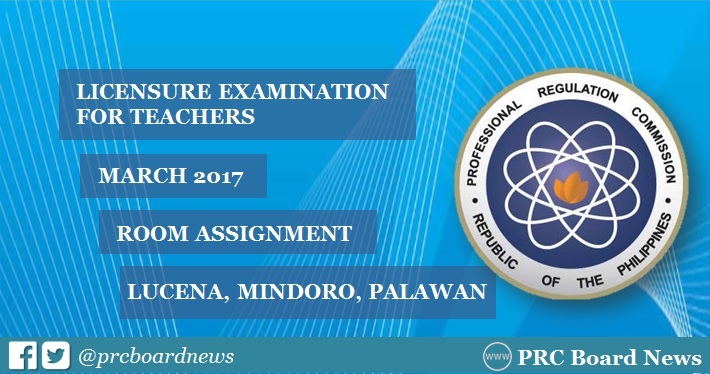 (Updated March 13) The Professional Regulation Commission (PRC) Lucena regional office has released list of room assignment for examinees of March 26, 2017 Licensure Exam for Teachers (LET) in Lucena City, San Jose, Occidental Mindoro and Puerto Princesa, Palawan. In February, PRC Lucena published unofficial list of examinees for LET. The agency advised further for any correction of the entries and place of examinations. Takers may contact 042-373-73-16 and 042-373-73-05. Mindoro and Palawan were added in the list of test centers according to PRC Resolution No. 1025 and No. 1028, respectively. March 2017 LET will be administered simultaneously in the cities of Baguio, Cagayan de Oro, Catarman, Northern Samar, Cebu, Davao, Iloilo, Legaspi, Manila, Rosales, Tacloban, Tuguegarao City and Pagadian. Bring the following: Notice of Admission (NOA) or Application Stub, Official Receipt, pencils no. 1 or 2, black ball pens, long brown and long plastic envelopes and extra pictures. IMPORTANT: PLEASE DO NOT BRING THE FOLLOWING ON EXAMINATION DAY: NON-BIODEGRABLE MATERIALS SUCH AS STYROFOAMS, DISPOSABLE SPOON & FORK, STRAW, DEADLY WEAPONS/POINTED OBJECTS. Note: PRC Board News (PBN) will also update this website for the updates and release of March 2017 LET results.